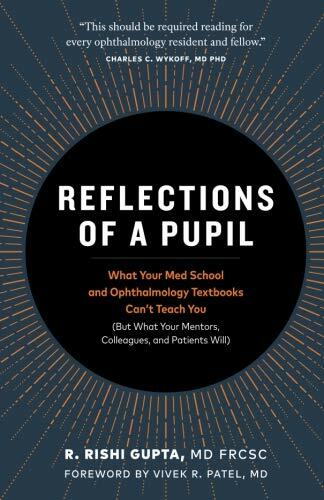 Reflections of a Pupil weaves together the rich tapestry of lessons that Dr. R. Rishi Gupta has learned from his unique journey through the art and science of medicine. Although trainees and junior attendings in the field of ophthalmology have ready access to the technical aspects of their field, this invaluable text will help these professionals focus on many other issues equally vital to their success: resiliency, communication, mentorship, ethics, and life-long learning. Dr. Gupta offers short, easy-to-read stories and case studies (with no memorization involved) that will resonate deeply with physicians. Readers will discover how it is possible to juggle the surgical, clinical, practical, and interpersonal demands of their specialties—while still maintaining a positive work-life balance. Written from the perspective of a peer, Reflections of a Pupil challenges readers to find the lessons that life and their profession continuously present for them. Dr. Gupta offers medical students, residents, and junior attendings easily digestible food for thought about how to grow into the physicians they have always wanted to be. View More In Medical Procedure. If you have any questions about this product by Ocean Playground Press, contact us by completing and submitting the form below. If you are looking for a specif part number, please include it with your message.